Did you know that the average American spends upwards of $700 on holiday gifts and goodies? That is a big chunk of change to absorb during a month. Many families use up their savings. OR they run up a credit card to be able to have everything that was requested under the tree, then use their tax return to pay everything off. 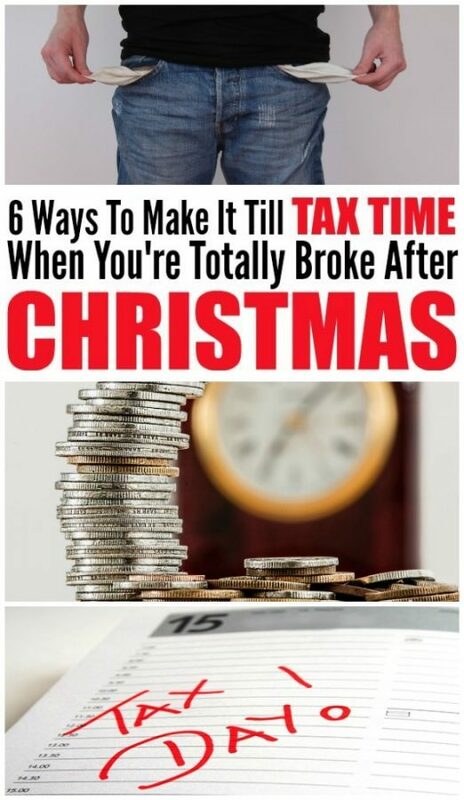 If you feel like your pockets are extra empty this month, try one of the following ways to make it till you get your tax return! 1- Utilize Yard Sale Sites: One man’s trash is another man’s treasure. Did you get a few gifts this holiday season that aren’t your style or that you already owned? Join a local Facebook yard sale group and list it. You will be shocked about what sells and for how much. New items and used items sell well if you take good pictures and list it for a reasonable price. 2- Donate Plasma: I’m not sure why it’s called “donating” when you are getting paid for it, but Plasma banks will pay you for your plasma! Income received from plasma donating is not significant, but it’s consistent and if you have two people in your household do it every week, you can bring home a chunk of cash. 3- Sell Your Hair: Are you always getting compliments on your hair? Then you might want to consider selling it; to the right buyer it could be worth thousands. The very best and most expensive wigs are made from human hair, healthy human hair! 4- Recycle: It’s good for the planet and good for your wallet! Certain states offer 5 or 10 cents per can or bottle by returning them to a deposit center. You can gather all the cans and bottles around your house, pick them up from the sides of roads or host a bring your own beer party and provide the hot dogs – then sell the cans after. 5- Scrap Hunt: Just like cans and bottles can be recycled, metal scraps like steel, copper and aluminum can fetch good prices and scrap yards. You can tear the metals out of junked vehicles and earn some nice extra cash at a local scrap yard or recycling center. Make sure you call ahead and know what metals they accept! 6- Pet Sit: January is a popular time to vacation, because it is the “off season”. If you know a friend that has pets is going on vacation, offer to board their dog for them instead of it going to a kennel. You could also baby sit or house sit.